Tablet computing is a trending innovation that holds great potential in the learning and development context. These mobile devices place education in the hands of learners, wherever they may be, and present endless possibilities for improving the quality and accessibility of education around the globe. In the consumer market, Tablet PCs are dominating, with devices like Apple’s iPad leading the way. As the trend grows, open source alternatives, such as Android Tablets, are keeping pace and leveling the market with low-cost devices that can be easily customised for high-impact (see analysis in The Economist). This presents even greater opportunity for education and development institutions to harness their value. 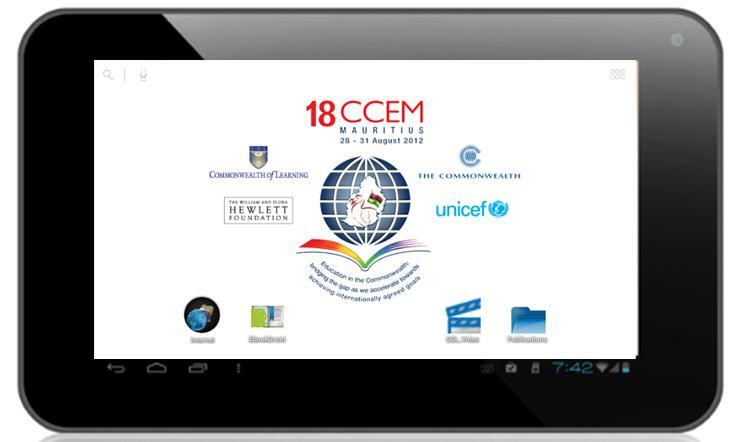 To demonstrate the potential held in these devices, COL ventured to acquire, customise and distribute generic Android Tablet PCs to county delegations at the recent 18th Conference of Commonwealth Education Ministers (18CCEM, Mauritius, August 2012). In collaboration with the Commonwealth Secretariat, and funded by UNICEF/Child-Friendly Schools and The William and Flora Hewlett Foundation, COL was able to execute this project. We acquired a volume of low-cost devices, and customised them with specialised applications and content that suited the unique context of the conference. Containing conference documentation, publications, educational resources, videos and demonstration software, the tablets were well received by Ministers and Senior Officials. Since this time, COL has been approached by others who are eager to undertake projects like this in order to further learning and development goals. In support of their efforts, we have summarised important aspects our own experience in the related pages. We welcome all organisations and individuals to consult this step-by-step overview as a guide for leveraging the opportunities presented by Tablet PCs as a tool for learning. A buying request was posted to Alibaba Manufacturer Directoryoutlining our needs and preferred specifications. Several offers from suppliers were received and reviewed, and the most sound and affordable one was accepted. The chosen supplier is the original manufacturer of the CORTX chip, commonly used in Android devices. An order for 200 Android Tablet PCs was placed. Tablets that failed testing were set aside for troubleshooting.Tablets were re-tested at various stages of the customization process to ensure quality was maintained. A custom booting sequence featuring the 18CCEM conference logo, as well as the logos of our contributing partners. A custom wallpaper featuring the same logos. An ‘eBookshelf’ application for accessing publications and conference materials in dynamic bookshelf view. An open source video player for high quality video playback. A notebook application for delegates to record notes during conference sessions. A collection of video content and publications of relevance to Education Ministers and delegates. A link to the Commonwealth Connects (C2P) online portal. Scripts were written to execute customizations on each device.Additional manual customizations were carried out on each device by a team of volunteers. The additional steps below are optional, and may not apply to all projects, though we include them here for reference. A brief ‘Quick Start Guide’ for users was designed and developed to accompany Tablet PCs. Labels featuring the 18CCEM event logo, as well as the logos of contributing partners, were designed and fixed to Tablet PC boxes. Devices went through multiple rounds of charging in order to maintain battery power during customization and ensure maximum battery life when presented to users. Devices were cleaned (screens and backs polished) and repackaged after customization.